Murder by Gaslight: Professor Strunk. The Strunks were both members of the Episcopal Church, where Myra served as organist and sang in the choir. The choir director was Charles V. Hoover, a thirty-eight year old unmarried man, “pleasing in address, and attractive in appearance.” Their roles in the choir required Mr. Hoover and Mrs. Strunk to spend much time together at the church, and Hoover was also a frequent visitor to the Strunk’s home, where Professor Strunk treated him as a trusted friend. Working as both an administrator and a teacher, Prof. Strunk was often at the Business College until late at night. 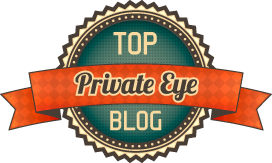 He had also made some real estate investments in Florida which required him to occasionally visit that state and be away from New Albany for weeks at a time. Upon returning from one of these trips, a friend called his attention to a squib in the local newspaper hinting at a questionable intimacy existing between a single gentleman and a prominent married woman—a vailed reference to Charles Hoover and Myra. Incensed, Prof. Strunk paid a visit to the newspaper office. After first stressing that the item in the paper did not specifically name anybody, the editor enlightened Prof. Strunk to the fact that in his absence, Charles Hover had visited his house and both publically and privately had given undoubted proofs of an undue intimacy with Myra. Shocked and amazed, Prof. Strunk set out on an investigation of his own, and everyone he spoke to knew of the affair between Charles Hoover and his wife. This was too much for Prof. Strunk to take, and on December 22, 1885, he left his wife and home and took rooms at the Occidental Hotel. He became too distracted to teach or run a business so he sold his interest in the Business College, and for the next few months did nothing but brood over his humiliating situation. He became physically ill and friends would later remark that he looked wild-eyed and they feared he would become violent. One day in April 1886, Strunk happened to cross paths with Charles Hoover in a New Albany clothing store. Strunk drew his pistol and attempted to shoot Hoover on the spot but the pistol missed fire and Hoover was spared. Now completely discouraged, Prof. Strunk decided to leave New Albany forever. He packed his bags and was preparing to leave for Florida when the police paid him a visit. The Hoovers had pressed charges and Strunk was arrested for assault and battery with intent to kill. Strunk easily raised bail, then immediately left for Florida. He could leave his home behind but he could not leave his demons, and by July they had driven him back to New Albany. On July 27, 1886, he was sitting in front of the Windsor Hotel in New Albany, when he saw Charles Hoover and his father pass by. He stood up and followed them for two blocks and when he reached the elder Hoover drew his revolver and fired twice knocking the father to the ground. He then fired twice at Charles Hoover, both shoots going through the left side of the body. Hoover fell to the floor of a barber shop he had been trying to enter for safety. Strunk pounced on him and started beating him on the head with the handle of his gun. He continued until a witness pulled him off and told him that Charles Hover was dead. Strunk lifted his hat to wipe away the perspiration, put his pistol back in his pocket, and quietly walked back to his hotel where he was arrested an hour later. Public sympathy fell to Prof. Strunk from the beginning and many former students, now successful business men throughout the country, expressed their support. During the two and a half months Strunk spent in jail, an estimated 1,500 friends and well-wishers visited him. The fact that Strunk murdered Charles Hoover was not disputed, but the question remained whether or not it was the premeditated act of a sane man. Prof. Strunk would plead insanity; never a popular defense, but given the visible changes Strunk had gone through, it seemed an apt defense. The prosecution argued that it was not insanity but premeditation that led Strunk, armed with a pistol, to the Windsor Hotel where he knew he would see Charles Hoover going from his home to his work. 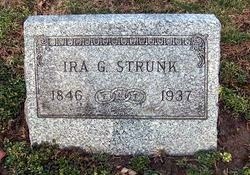 The prosecution mentioned, only in passing, that Strunk believed that the deceased had injured him “in the matter of his domestic relations.” The defense introduced more than a dozen witnesses who had knowledge of Hoover’s relationship with Mrs. Strunk, including Mr. and Mrs. John T. Steele who lived next door to the Episcopal Church. The Steeles both saw Charles Hoover, one evening, enter the church by climbing through a window, and soon after saw Mrs. Strunk enter the church through the front door. They heard no music from the church that night. He was on the adjoining lot almost opposite a rear door of the church, and saw Mrs. Strunk seemingly fastening up * * * * (not fit for publication) was buttoning them up. Her clothes were up. She as in the little vestibule, a little room at that door. Hoover was in there at the time with her, with his coat and vest off and one suspender down. They were in the little ell part of the church. During the next week witness saw them lying down near the same place and under such circumstances as to induce him at the time to believe that the were * * * * * * (not fit for publication). He was on the porch when he saw this. They were in the church between a quarter and half an hour. She went in the church first and Hoover came shortly after. They were lying down close together, her underclothing were visible to the witness. Could not see her head. Her clothes seemed to be * * *. Dr. W. B. Fletcher, Superintendent of the Indiana Hospital for the Insane, gave extensive testimony regarding Prof. Strunk’s mental state and concluded that he was “Undoubtedly insane.” Another physician, Dr. Barnes, concurred. 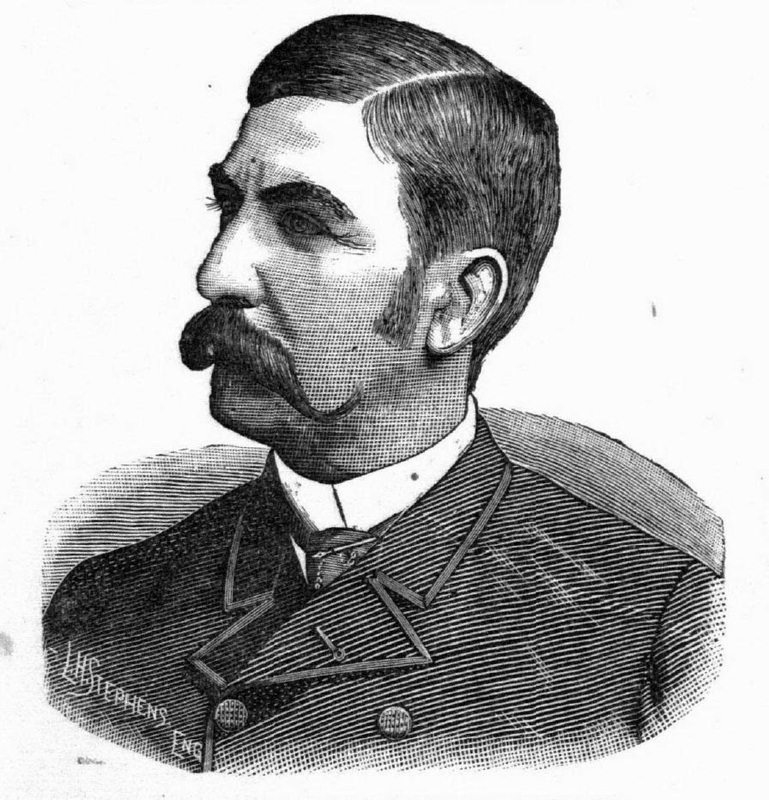 A number of Prof. Strunk’s friends and associates testified to the profound changes in his personality upon learning of his wife’s infidelity. Verdict: Not guilty by reason of insanity. By the time the jury was ready to report, the Court House and the streets were filled with people anxious to know the result. When the verdict was read, the multitude gave expression to their feelings and approbation in a shout never before heard in the city. Prof. Strunk was conducted to the residence of Sheriff Loesch, where he and the jury took tea together. After supper it is thought five thousand people called to congratulate him. Such an expression of sympathy and interest was never before extended to a prisoner in this county. free man again. The same day, Myra Strunk secretly left New Albany with the children, and moved back to her hometown in western Pennsylvania. Prof. Strunk vowed to get his daughters back at any cost, but there is no indication that he succeeded. Prof. Strunk remained in New Albany, returning to his position at the Business College. He retired in 1907 and moved to California. Four years later he returned to New Albany where he remained until his death in 1937. 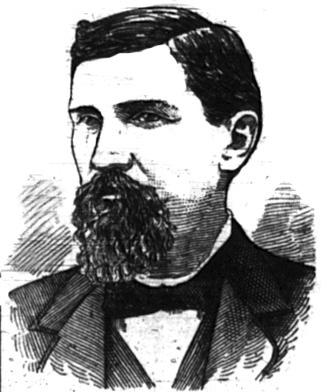 Trial of Prof. Ira G. Strunk in the Floyd Circuit Court, For Killing Charles V. Hoover at New Albany, Indiana, July 27, 1886. New Albany, Ind. : The New Albany Ledger Company, 1886. "Fatal Shootings at Lousiville and New Albany." Elkhart Daily Review 28 Jul 1886. "Sequel to the STrunk-Hoover Murder." Elkhart Daily Review 14 Oct 1886. David Rumsey Map Colliction: Plan of the City of New Albany, Floyd Co., Indiana..
Find A Grave: Ira G Strunk. 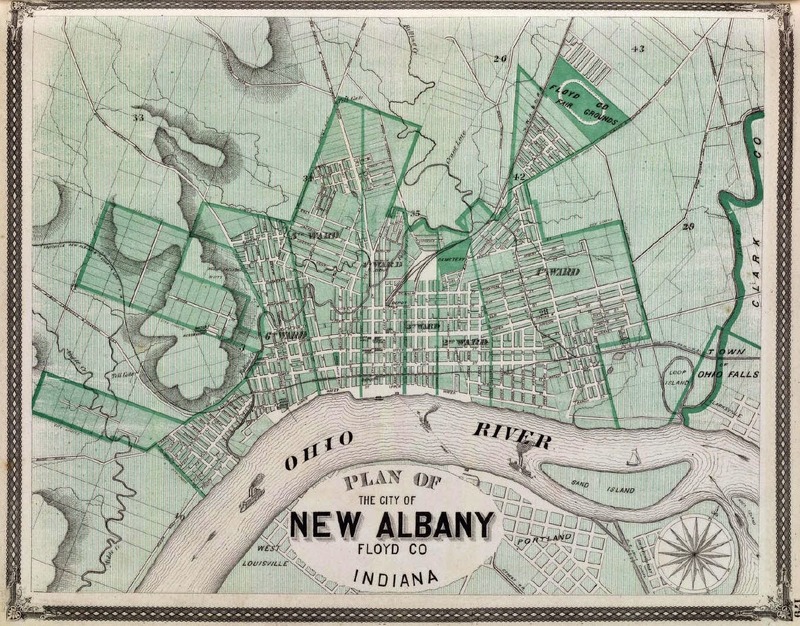 Our History New Albany: Desparate Houswives - 1886 style. And yet if you proposed a statute criminalizing adultery with the death penalty, I bet the residents of New Albany would have at least paused a moment before enthusiastically passing it.